Every year we like to decorate our house for the autumn. My son’s favorite project is building a tree in his room. I started doing this a few years ago when we wanted the house to be festive without having a lot of money to spend. This tree is made from nothing more than a roll of brown butcher paper, left-over construction paper from around the house, and a roll of masking tape. 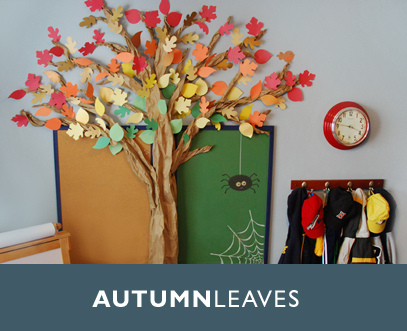 With a little time and effort, spent cutting leaves mostly, you can grow a tree just like this for a great kid’s room decoration. Here’s how it came together. I started by sketching some different leaf shapes inspired by the trees around our neighborhood. You can also look up some clipart and use those as a template. 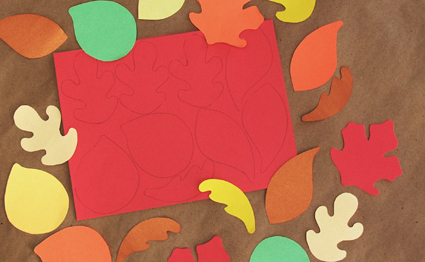 I like to trace a full sheet of leaves and cut 3-4 sheets at a time. The next step is cutting the butcher paper in to a long and wide strip for the trunk and several small strips for the branches. Rather than rectangular strips, they should be cut more like long triangles. This will help to create a branch effect that gets smaller as it grows out from the tree trunk. You can hold up the paper to your wall to measure and get an idea of how long to cut the paper. 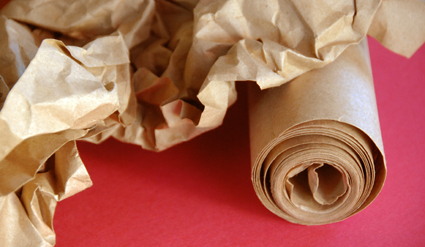 Once cut, crunch and wrumple the paper pieces to create a rough texture that simulates tree bark. To build the tree, start with the trunk. You’ll use lots of masking tape to adhere it to the wall. I generally form the trunk with my hands, scrunching and twisting it to make it get smaller as it reaches the top of the tree. As a general rule of thumb, give it a few twists and turns to change the angle, rather than making a straight line. Very few trees grow perfectly straight. 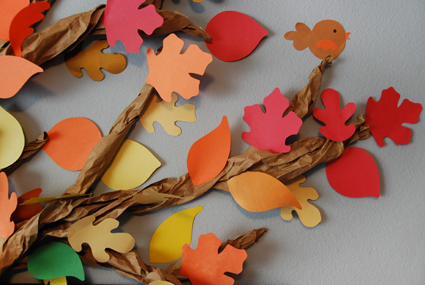 Follow by building out branches from the trunk, starting with the largest pieces first and using short little pieces to branch out from those. Tree branches grow just like our our arms that connect to smaller hands and on out to even smaller fingers at the ends. I discovered that masking tape comes in a a variety of ”stickiness” levels. If your tape is not particularly strong, you may find as I did that the branches will be a constant problem falling off the wall. This is no fun, so be sure to buy some really sticky tape. Once your tree trunk has been built, its time to attach the leaves. I like to mimic how a real tree turns its color from the outside in. The core has a few green leaves that transition to the bright oranges and reds on the tips. Have fun experimenting with the colors! I think it would be really fun to do a whimsical tree in a girls room that is done in shades of pink and purple, maybe even with a white tree trunk. If anyone comes up with their own variation, I’d love to see photos! So amazing!!!! I’m wondering if I could do a Christmas tree version next month!? Thanks for the creative inspiration!!! Absolutely! I also thought about building a Christmas tree in one of the kids bedrooms. Maybe it would be filled it up with ornaments instead of leaves, and maybe add a few partridges and birds for a whimsical twist. I’d love to see what you come up with!